4-Word Review: Children frighten their governess. Legendary British actress Deborah Kerr plays Miss Giddens, the governess hired to care for two children at a sprawling English estate. However, the children are not exactly as they seem. Strange occurrences and behaviors begin to manifest as well as several ghostly sightings, which leads Miss Giddens into believing that the children may actually be possessed. The film is based on the Henry James novel The Turn of the Screw. I have not read the book, but those that have feel this is a pretty satisfying adaptation. I did like the slow, methodical pacing. It helps to build the tension as well as enhance the mystery. Things are revealed in deliberate layers, which kept me intrigued throughout. Director Jack Clayton shows a marvelous handle on the material. The estate that they chose for the setting is perfect and captured well in glorious black and white by famed cinematographer Freddie Francis. There is a lot of spooky imagery throughout including a creepy nightmare sequence in the middle. The garden with its hulking, strange statues is used quite effectively especially in the haunting finale. The music also grabs your attention right from the start with a very eerie song that is played before you see a single image on the screen. The song is similar to the one used in Rosemary’s Baby. In fact there are several things here that reminded me of that film as well as The Shining. Kerr was a good choice for the increasingly frightened governess. I loved that scared expression on her face, which becomes progressively more frequent. Yet she is also effective when the character decides to become proactive by taking matters into her own hands and singlehandedly trying to ‘cure’ the children herself. This also helps make both the character and the story a more multifaceted because you are never sure if this stuff is really happening or all just inside her head. What really impressed me the most though was the performances of the two children especially Martin Stephens who plays Miles the young boy. His character shifts through many different moods, playing an innocuous child one minute and then a menacing, volatile one the next. He does each one flawlessly and becomes practically mesmerizing in the process. Pamela Franklin is also fine in the role of Flora. This was her film debut. Eight years later her career would peak playing her signature role as Maggie Smith’s nemesis in The Prime of Miss Jean Brodie. Another thing that I liked about the children is that they are initially portrayed as being normal and even engaging. This is unlike other films with a similar theme like Children of the Damned or Children of the Corn where the kids are given creepy features right from the start. Here it works better and is more chilling to the viewer because the children’s dark side is unsuspected. Unfortunately, despite the film’s impeccable technical quality, I still went away feeling unsatisfied. Part of the problem is that nothing really happens. The ghosts appear but then do nothing but just stand there, which quickly becomes tiresome. One scene in particular has the camera constantly cutting back to the lady ghost standing across the lake until she starts to look like a mannequin, which I suspect she was. The buildup is good, but I would have liked more of a payoff. The ending is much too vague and gives no explanation as to why this was happening, if it was happening, or whatever became of the main character. I couldn’t help but feel that this story would have worked better as an episode from one of the old horror anthology series like The Alfred Hitchcock Hour or even The Twilight Zone where it could have all been compacted into an hour. A hundred minutes seems like much too long for such little to happen. 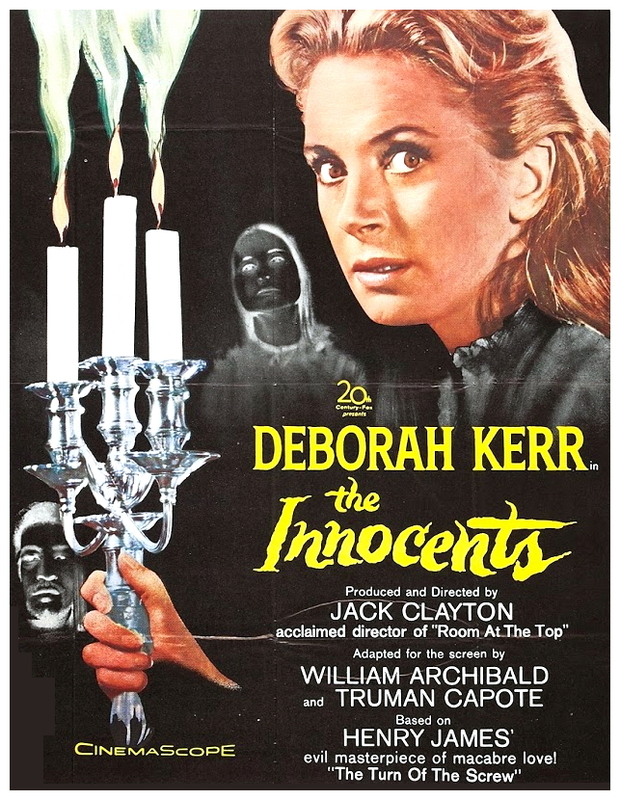 It is also interesting to note that in 1972 a film came out entitled The Nightcomers starring Marlon Brando that attempts to speculate what happened to the children before the main character of the governess arrives and before James’s original story begins. This entry was posted in 60's Movies, Black & White, British Movies, Foreign Films, Ghost Story, Movies Based on Novels, Mystery and tagged 60's Movies, Black & White, British Movies, Foreign Films, Ghost Story, Movies Based on Novels, Mystery. Bookmark the permalink. You have brought up some very good points , appreciate it for the post. I’ll have to watch this movie again. One of my favorite Ghost Stories on celluloid. I dig everything about it. I believe I enjoyed it more than you did but still a good write up! I need to check out The Newcomers. Sounds interesting. Have you ever seen The Changeling with George C Scott? Thanks! I saw ‘The Changeling’ years ago and really need to see it again. I remember Scott giving an interesting performance. Thanks for your comment. A distinguished literary adaptation with screenplay by William Archibald and Truman Capote.Superb performances and direction with stunning sets and cinematography. Regardless of genre, this is one of the best films of the 60s and warrants repeat viewings. Where are the Oscars this film deserved?